Fastkap Truck Canopies have been manufactured and distributed by Fastkap since 1998. The Fastkap product line of retractable truck caps is made in Kelowna, British Columbia. The company sources most of its mechanical parts locally. The Seamark Marine Grade Waterproof fabric that provides the canopy cover is manufactured by Haartz Corp in Acton, Massachussetts. 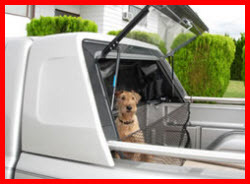 The Fastkap Truck Canopy is available for many models of Ford and Chevy pickups from 1988 to the current year. Essentially this truck bed cover is made of the Seamark fabric supported by metal bows that slide on stainless steel bed rails. You get to pick a fabric color that best matches your pickup. It kinda works like an accordion. Push it into its shroud (a little house up near the truck cab where the canopy lives when it is retracted) when you want to use the truck bed. Pull it out of its shroud and extend and secure it when you want to use it as a canopy. The Seamark tarp material extends smoothly and the shroud based spring loaded tensioning system makes sure the fabric is tight in all weather condions and temperatures. When extended Fastkap Canopy presents nicely and secures your truck bed against sun, rain and prying eyes - just to name a few. 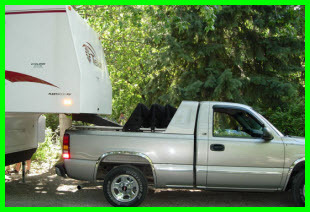 When retracted you can use your truck bed as a fifth wheel, for tall loads like bikes & RVs, and for any other normal use of your truck bed. The Fastkap retracts and extends in seconds. It has a rear lockable lift door utilizing tempered glass and gas struts. The shroud comes in black, white or paint matched for your vehicle. The whole thing is pretty much waterproof and it handles a snow load, like it should if you need to use it in British Columbia! The Shroud which houses the retracted canopy uses tempered glass to give a full rear view from the cab even when canopy is retracted. The Full Height of your truck box is available when the Fastkap Canopy is retracted. When extended, your truck box area is secure against weather and visual inspection. A fabric canopy is unusual. A truck canopy is usually made from fiberglass, aluminum or steel. And even though its a fabric canopy you still have a tempered glass, lockable lift gate with hydralic lifts on a powder coated metal fame. Made in North America, the mechanical parts made in Canada and the Seamark Fabric for the canopy cover is made in the USA. All Fastkap Truck Canopies and their parts are made in North America (Canada or USA). The Fastkap Product Warranty is a guarantee for 5 years against fading and normal wear and tear of the Seamark Fabric. The mechanical parts of the truck canopy are covered by a 1 year warranty. Fastkap is proud of the fact that many of their early canopies from the late 1990's are still in use. The Seamark Fabric used in the Fastkap Truck Canopy is a 2 layer fabric laminate. A solution dyed acrylic yarn is woven into fabric which is then backed with an embossed PVC (polyvinyl chloride) sheet. The solution dyed yarn resists fading and discoloration since the dye permeates the yarn to the core. So the yarn is whatever color you pick all the way through. 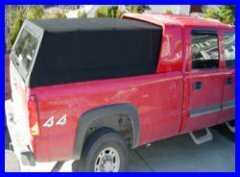 Some other benefits of using a marine fabric is mold resistance and a waterproof surface, both great attributes you want in your truck canopy.